Samsung’s premium Chef Collection line is designed by Master Chefs with the sophisticated cook in mind. Every appliance in the collection has been tested and approved by Michelin Star chefs to build the best kitchen possible. Can both ovens be combined to use as one large oven? Yes, I use mine as a large oven unless I need to use 2 at once, and flex duo shelf stores easily in the top of the warming drawer. Can this oven be ordered without the warming drawer? Do any of the slide-in Flex Duo ranges come in black? All I've found is Stainless Steel. Thanks! CHEF Collection 30 in. W 5.8 cu. ft. Slide-In Flex Duo Range with Self-Cleaning Convection Oven in Stainless Steel is rated 3.7 out of 5 by 24. Rated 5 out of 5 by Chris from Finished our Kitchen Originally we had one of the old ovens with a clock a the back, no convection oven and it sat in our kitchen like a sore thumb. We hated using it so we decided on this oven. It fits perfectly in to 30" gab so well that, at a glance, you would think it was integrated. The over hang at the sides also helps with the look as well as avoiding the spills down the sides. Our kitchen now looks finished! Then there is the features.... more than a Swiss army knife! We love the functionality of the double oven and the option to remove the divider to make a single oven for bigger jobs. Everything is very powerful, remember to adjust your cooking times and temperatures! There are two down sides: 1. We found the surface scratches easily, which is disappointing. 2. My wife is now looking at the dishwasher with disdain, and wants to get the one that matches the oven! Beautiful and functional! Rated 5 out of 5 by Hissykrissy from Oh my goodness! This range has everything. I got this range a week before Easter after doing a lot of research and reading comparisons and reviews. I already have Samsung devices but had never considered a Samsung range. I'm so glad I did. It's "Maiden Voyage" was on Easter when I had everything going at the same time. The upper oven held au gratin potatoes, bottom oven roasted 2 trays of asparagus and the warming oven held freshly baked rolls. All of my guests were standing in the kitchen watching things come out and were very impressed. So was I. It performed with flying colors! I'm also impressed with how quickly the top oven heats - 425 in less than 5 min. so my toaster oven is off the counter. Needless to say I would recommend this product to anyone and everyone. I'm finally happy with a range and am loving using it (I sometimes find excuses to cook/bake something, anything). If it holds up as well as I'm hoping it will, Samsung definitely deserves many gold stars for this one. They've thought of everything. I wish the timer had a louder sound but that's the only drawback so far. Rated 2 out of 5 by margaret from NO This is a very expensive range. I was so excited about it but not anymore. After a couple months I had thanksgiving dinner at my house. The oven turned off after the turkey was half cooked. It took a half hour to get it going again. I was NOT using the probe, so it wasn't that. Then a few months later, I cooked a whole chicken, same thing happened. I asked for a service person to come, but he just CALLED me and said that I need to keep wiping out the hole where the probe SHOULD go, as he said it gets testy if it might have anything in it. Again, this is a $2,500 range, after 8 months, I called for service again as the whole thing, especially the stainless on the front edge is all scratched up. It looks 8 years old, not 8 months. I am a very clean person especially in my kitchen. When the service person came (for 2 minutes) he said someone would call me in three days with help. After FIVE days, I called them. I was told that they don't cover scratches or anything of that sort. Then I received a survey in my email but when I clicked on the link, it took me to a blank page. Then I received THREE follow-up calls asking if I was happy with my "SERVICE". NO, I AM NOT HAPPY AND CERTAINLY NOT AT THE PRICE OF THIS APPLIANCE. VERY VERY UNHAPPY. WILL NOT BUY SAMSUNG AGAIN AND WISH I BOUGHT GE. Rated 5 out of 5 by Tristan from Great Range for the Pro and Novice Alike I cook a great deal and moved into a house on the beach that we are renting. The appliances were awful and so I looked into purchasing new appliances that I would take with me into whatever house we purchase next. 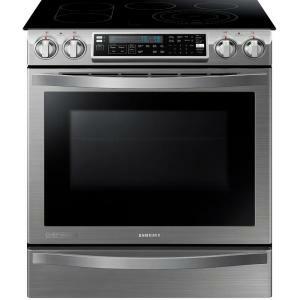 HD was running a great sale on the Samsung Chef Collection and so I bought the range, refrigerator, and microwave. I have used the stove several times and being someone who likes gas cooking, this is about as close as you get to gas like control. I'm not much of a baker and when we do we typically use the big green egg, but the dual zone oven has been used twice and worked perfectly. Highly recommend this especially if HD is running a special. Rated 1 out of 5 by PMLA from cooktop cracks from heat I spent about 10K to get the whole chef collection series, including the range. I had it for 6 months and the cook-top glass broke from the heat while cooking. This is not covered by the manufacturer's warranty. It's disappointing that a product with such a price is made of poor quality material. I'm very disappointed that I bought this product. Rated 1 out of 5 by UnhappyCustomer from Do NOT buy this range! Cooktop is extremely fragile! 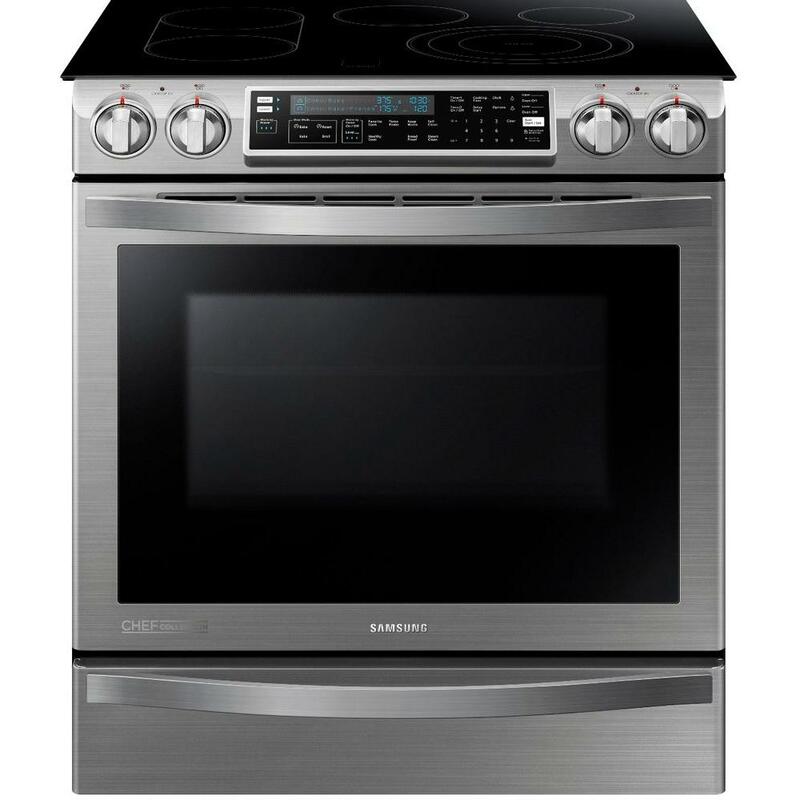 My complaint is with the design of this range, and the other Samsung's with the same cooktop. The cooktop is very fragile! When my wife was cooking, the lid slid off a glass dish about 6 inches off the surface, and the cooktop cracked from the left side near the back all the way across to the front! We did some web searches and found out that this has happened to a lot of people who have bought this range. We were told that this was not covered by the extended warranty we purchased, so we had to order a new glass top from Home Depot for $229 plus shipping. We decided to do it ourselves because we would have ended up paying a couple of hundred to a technician for labor alone. When the new cooktop arrived we discovered that there were no replacement instructions included with the part, so we started looking online but found nothing. When we called Samsung they said they would not provide instructions because the part "is not user replaceable". I got mad and they eventually told me I could go to SamsungParts.com and PURCHASE a service manual! Anyway, long story short, I bought the manual and replaced it myself. It was not a complex job, just a lot of work. If it cracks again I'm getting rid of it, and I will NOT replace it with a Samsung! Rated 5 out of 5 by WifeandMom from Awesome range! I have had this range several months now through Thanksgiving and Christmas large family dinners. It is the most awesome range! The bottom oven accommodates a large turkey and I am able to do stuffing in the top oven at a different temperature. I did the same thing with ham and scalloped potatoes. I have used every feature. The bridge works great with a griddle. The warming drawer is excellent and doesn't dry food out. I enjoy three racks which I never had before. I looked at many ranges that have two ovens and I am glad I bought this one. It has the option of two ovens, but has three racks to use if I don't put the divider in to separate the ovens. The divider stores in the warming drawer below but it can stay there when I use the warming drawer. Also, when I looked at the two oven ranges, the bottom oven door goes clear to the floor and I would have to stand on my head to reach the bottom rack. This range has the warming drawer on the bottom, so the oven rack and door is up higher. The steam clean feature is great and the fast boil burner is really fast. This range has actually made me cook more than I used to. The only negative that I would suggest for Samsung to change is add another large burner on the top. There is only one large burner for a pasta or stock pot. The left side has the bridge between to small burners. It would be nice to have the left side have a large burner option. This is not enough negative to keep from buying the range, though. I get by with the one large burner. Also, I do have to keep the controls locked because we bump them getting into the microwave oven above the range. (I'm hoping to remodel and move the micro but not because of the range.) Anyway, this range has been well thought out by its designers.